I first had these at Kevin & Sarah’s place. They made cake pops- I bought the sticks and all– but during my first pop- i gave up and decided to go w. cake balls. I used vanilla cake and frosting– but you can go w. whatever– chocolate, red velvet etc. Baking chocolate is the way to go for dipping because it hardens well. I ran out- and tried w. semi sweet chocolate chips- but that was much messier. Sprinkles are a great way to dress them up- and cover up those imperfections. There is something so delicious about the cake box/store bought frosting– reminds me of my youth– and with all the preservatives these keep very well. Make cake according to directions. Cool cake totally. Break up cake with your hands (which it oddly fun). If you have one, you can put it in the food processor for extra fine uniform crumbs. Put in a big a bowl, mix w. about 3/4 tub of icing or 1/2 cup of homemade frosting, until it comes together- can use your hands. Mix in additional frosting if necessary. Roll mixture into 1″ balls and place on a cookie sheet. Cover with plastic wrap and refrigerate for an hour or overnight. Melt chocolate in microwave- in about 15 second intervals, stir and repeat. 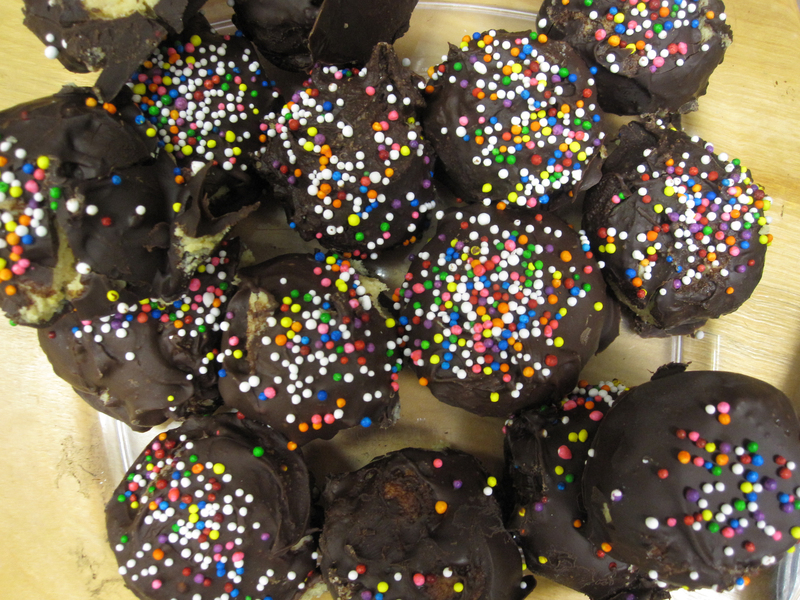 Roll balls in chocolate (twss), sprinkle w. sprinkles, put back on cookie sheet to harden. These are delicious. Everyone of Anonymous’s friends loved these treats: WhoKnows, Mysterion, Enigma, No-Identity, basically the whole gang. These are just super-delish. I’m going to make these. Maybe I will live on the edge just a little and use Funfetti cake mix – my fave. Thanks for the recipe!! soo much sweet deliciousness on the blog these days. don’t even know where to start, but i am thinking the oatmeal choc chip look best (and easiest). can’t wait for brunch items to begin showing up en masse in a lead-up to jan 2. Starbucks sells these now. Just like with their rice krispy treats, these won’t compare to SnackoBacko’s!